A Greek Hoplite could not ask for a better shield than the Steel Greek Bull Shield. This shield is a faithful reproduction of a Greek-styled shield made from quality materials and features several intriguing and useful features. This shield is made from thick, dished steel and features a simple depiction of a bull on the front. 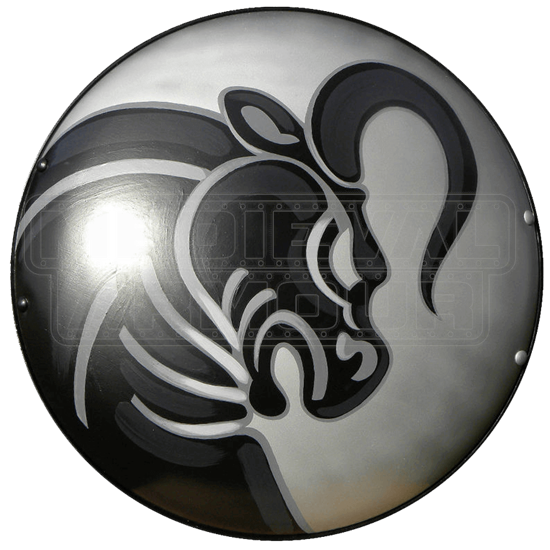 The background is steel-silver in color whereas the raging bull is shown in simple black, which matches the border of the shield perfectly. A flat wooden brace has been attached to the back of the shield to make carrying and using the shield that much more comfortable. Two heavy leather straps are attached to the wooden brace and are designed to secure to the arm to the brace so that the shield can be used easily. One brace goes around the forearm while the other is intended to be gripped by the hand. These two braces are spaced approximately 11 inches apart, which ensures a grip that is both balanced and effective. Three additional leather straps are also attached to the wooden brace. The two smaller looped straps are desired to secure a sword in place, just like some Greek warriors were known to do. The largest leather strap is adjustable and is added purely for the purpose of wearing the shield over your shoulder. Measuring approximately 27 inches in diameter, this shield is exactly the size that a warrior needs it to be. It will defend your chest and vitals with ease, yet is not so large as to be extremely unwieldy. The shield weighs approximately 10 pounds. The front of the shield has been coated in a clear topcoat, which provides additional protection that helps to preserve the shield from whatever wear or tear it might endure over the years. The simplicity of the Steel Greek Bull Shield belies the incredible function it has. This shield not only looks great but can be used in virtually any combative scenario with knowledge that it is a sturdy and secure shield that will not let you down.